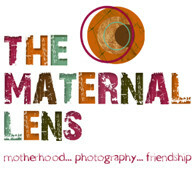 Aimee is hosting her monthly Greeblepix photography contest and this month she has a sponsor for the prize. You will have to take a look. At the back of our yard we have a chain link fence and this little tree is trying to grow on both sides. The leaves on this little thing were stunning and I could not resist taking a shot of it. Processing: I used Adobe Lightroom for this photo. I bumped up the contrast and the brightness. Then I added black slowly while watching my colors carefully, I do not want to lose the vibrancy of my color when I do this but I love the depth I can get from adding some black. Then I added a vignette to keep the focus on the leaves at the center of the image. on October 20, 2008 at 7:07 pm | Reply Auds at Barking Mad! Wow. Amazing. What a great shot and wonderful work with Adobe Lightroom. I always enter this contest thinking I want to win. And then I see the other entries and feel so silly and insignificant. If this amazing photo of yours doesn’t at least make finals Ima have to have a little talk with Aimee, ya know? Wow- great shot and your Lightroom work enhances it beautifully. What camera do you use, out of interest? Wow – that is a very cool effect! Great processing. I was struck by the colors. Gorgeous! 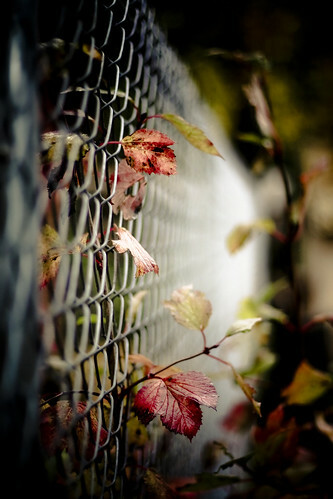 Love the contrast between the natural leaves and the manufactured fence. Added some black?! hmmm…..I am curious to know more about this process…..never heard of that before. Your photo is a stunner by the way! I love this photo. It’s nice and sharp and clean, I love the black. Thanks for playing again this month! YOU ARE A FINALIST! Awesome photo.